Hello everyone. Thank you for your wonderful forum. 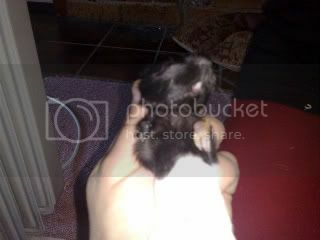 Our female Guinea Pig, Gaby, gave birth the other day which was a real surprise. Firstly, because the pet store told us that she was not fertile as she was with male Pigs for over a year without falling pregnant. Secondly, she had been with our male, Pepe, for over 6 months before anything happened. Anyway, she gave birth to two babies, and one still birth. We left them alone with their mum for a couple of days, and handled them for the first time last night. Unfortunately upon further inspection we observed that both babies have deformed front legs. One of them has one front leg that appears normal, however the the other's front legs are both withered. Here are some pictures. Apologies for the poor quality. This is the one with one good leg. You can see that the other leg is shriveled. Both of this poor guy's legs are shriveled. They have obviously grown since birth, and look very healthy other than the legs. Has anyone had experience with anything like this before? If their disabilities aren't life threatening or don't affect their quality of life in any way, we will of course give them all the support they need to live as normal a life as possible. Have they been to a cavy savvy vet? That would be my first stop. Please remove Pepe from Gaby, she may already be pregnant again. 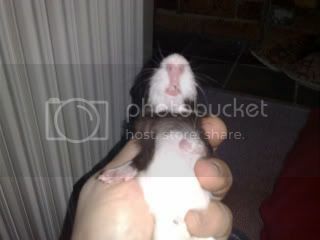 Guinea pigs go into estrus within hours of giving birth. If you have a male baby, he can get mother pregnant as early as 21 days. I agree that a vet visit to a cavy savvy vet is a good starting point. I'll leave the more experience ones to give more advice. The baby with one good front leg (the back legs are normal, right?) should be okay. He may need the shriveled leg to be amputated, but most pigs do well with a missing leg. I don't know how well the second baby will do with no working front legs. Probably Gaby was getting pregnant frequently but miscarrying because of deformities. Definitely she should never have babies again. I would not rule out spaying, in fact. It's possible that some kind of physical or water therapy would help the deformed limbs be more functional. Thanks for your advice and information. The Guinea Pigs have been seperated to avoid further pregnancies. They haven't been to the vet yet as no vets are open here on the weekends. We're going to take them straight in on Monday morning. They seem to be very happy and have already started to nibble on veges. Poor babes - such a rough start in life, but I'm glad they are in a safe place. I'd definately weigh them everyday to make sure they are gaining weight. The water therapy is a great idea. (I have a 3 legged guy that does fabulous). Does the baby with both front arms deformed have normal back legs? I think that if you start the water therapy early, the pigs can learn that there is nothing to be afraid of. My Henry actually likes to half swim/walk in deeper water and I think this is because he is sued to bathing and grooming from an early age before I got him (he was long haired show pig). Good luck with your little guys. It's a great sign that they are eating and moving as much as they can. albi, it would be great to have larger, more clear pics to add to this thread (details are a little difficult to make out). Should you be able to take better pics, I can add them permanently to your thread so people in the future can see firsthand some of the risks of breeding. You obviously did not intend to have pups. The deformatives may also be influenced by diet and the growth of the fetus (poor before she got to you). You may wish to read over gl/diet.html for some general advice. Last edited by Lynx on Sat Jul 05, 2008 5:12 pm, edited 1 time in total. "I can add them permanently to your thread so people in the future can see firsthand some of the risks of breading." No. You did not just type "breading." I agree, clearer pics would help. The one pup with the "good" front leg looks to me like even that leg is seriously going the wrong direction. Bad breading causes tremendous problems in the kitchen! Just think of all the homless breads waiting next time you think of pulling out that bread machine or going to the grocery store! Plus, the bread isle never has good directions for caring for your newly bought bread. Good thoughts for the babies! See what the vet says. I am very much afraid he or she will say it will be in their best interest (and yours) to euthanize them. If they are otherwise healthy I would emphatically disagree. Try the water therapy. This young the muscles might be able to develop into usable, if not fully normal, legs. I would also second the cart idea. Although it may not work as well for front legs as for rear, I don't know if anyone has actually tried it. It may work just great. The key to me would be if they are in all other ways healthy. If there are other deformities or malfunctions, internally or externally, it will be much harder, but if they are otherwise healthy, they will certainly have a chance if you are willing and able to help them out a little. Thanks so much for your great advice and support. We phoned around last night and found a vet that was open on sundays. As it turns out, he has experience with pigs as well! When we went to take them, we noticed the smallest one (the dark headed fellow with both legs deformed) was very lethargic. We hurried, however, the poor little guy died on the way :-(. The good news is that the other guy (with only one deformed leg) appears in very good condition. We need to monitor his weight and ensure he's eating. If he doesn't gain weight, we will bottle feed him as long as he needs it. The vet examined the one that didn't make it, and said that all the bones in his front legs were totally fused and malformed. He suspects that his mother is the product of severe inbreeding by the pet store. When we purchased her, they described her to us as 'breeding stock'. However, she never become pregnant so they were going to euthanize her. So cruel. Anyway, the parents were seperated before birth to ensure this doesn't happen again. I feel bad, as Pepe (the male) seems very upset and flustered that they're not together. The new guy is a male, so when he grows up we can put them together maybe? I'm just concerned that they might fight. Thanks so much to everyone for the valuable information and support. We are going to pursue water therapy also. I think it's a great idea to put them together. At three weeks, when you need to separate the baby from his mom. "If he doesn't gain weight, we will bottle feed him as long as he needs it." NO DAIRY PRODUCTS OR MILK REPLACERS/FORMULAS! Sorry to shout, but we've "seen" too many posters unintentionally kill the pups, trying to go that route. Please read this site's handfeeding pages and use a special herbivore supplement such as Oxbow's Critical Care. Sorry about the pup who didn't make it. If you have any trouble getting the Critical Care, you can use pellet mash given in a syringe. I'm sorry the other pups didn't make it. I'm sorry about the pup that didn't make it. Critical Care is fantastic and is stocked in Australia too - I think you are from Australia? (I noticed that your location on GPC was Bundaberg, QLD). If all of those places are too far, than I can get you in contact with some guinea pig owners who live in QLD that may be able to send some up to you.